A mountain village, located in the province of Imperia, in the upper Val Nervia, crossed the river with the same name. 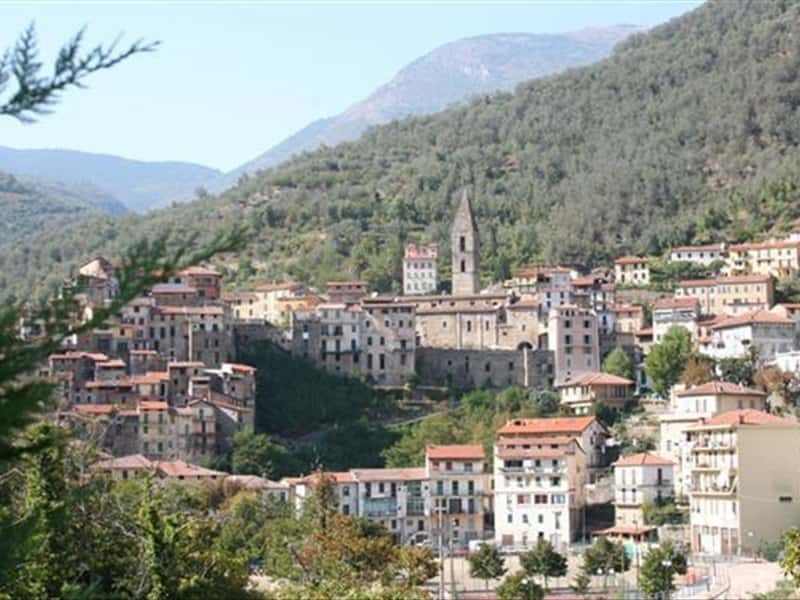 It includes two districts: the village of Pigna and the one of Buggio. The valley into which it opens features at its back the Ligurian Alps, proposes a series of very steep slopes covered with olive trees and vines. The cultivation of crops in this area date back probably to Roman times, as witnessed by the names of some lands, that derive from the Latin names. The main economic resource of Pigna is agriculture, especially olives and beans, particularly appreciated, not only in Italy. It is also important for its health and Spa tourism. The oldest part of the town presents the characteristics of the Middle Ages such as the feudal castle, where the inhabitants of the countryside would shelter from enemy attacks. The narrow and steep streets of the old main centre draw large circles that interconnect between themselves by archways and tunnels. The discovery of prehistoric remains has allowed historians to assume that the first settlement of Pigna may have belonged to the town Albintimilium, Ventimiglia. Other traces of a Roman settlement has also been found in the area. Between the XII and XIII centuries the counts of Ventimiglia erected a castle in a defensive position on the strategic road that connected Ventimiglia to Triora. From the XIII century it passed to the counts of Provence, between 1200 and 1300, the entire valley Nervia was involved in the fighting between the Guelphs and Ghibellines until 1365, when peace returned. Pigna was ceded by the Governor of Provence to the Savoy in the late XIV century and three centuries after, it became the dominion of the Republic of Genoa until the Congress of Vienna, when it was ceded to the Kingdom of Sardinia and then in the Kingdom of Italy. The Church of San Michele Arcangelo; built in the XIII century in Gothic style; it was expanded in the XVI century and today it presents itself in the same way. It features a façade of local stone valued by a rose window of white marble built in 1450 by John Gaggini Bissone. Within one major nave separated by two rows of columns into two aisles and a XVI century altarpiece by Giovanni Canavese. Adjacent to the Church a stone spire Bell Tower, the Oratory of St. Anthony with a Baroque façade. Loggia of the XV century supported by stone columns adjacent to the Church of San Michele. The church of San Bernardo was built between the late XIV and early XV century and still a remarkable series of frescoes by Canavesio of 1482. The Oratory of Saint Anthony Abbot has a Baroque façade. The Parish of St. Thomas founded by Benedictine monks in the XI century. The Shrine of Our Lady of Passoscio. This town web page has been visited 21,310 times.